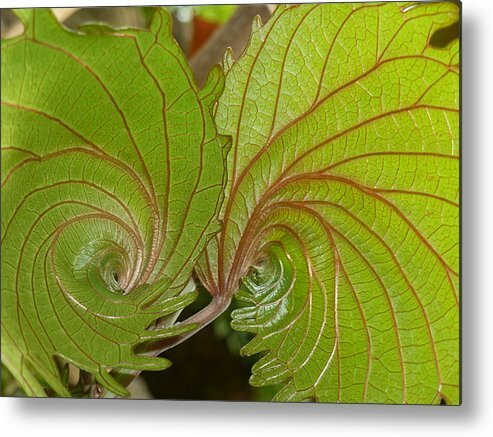 Nature's Fractals by Beth Akerman - 8.000" x 6.000"
Nature's Fractals metal print by Beth Akerman. Bring your artwork to life with the stylish lines and added depth of a metal print. Your image gets printed directly onto a sheet of 1/16" thick aluminum. The aluminum sheet is offset from the wall by a 3/4" thick wooden frame which is attached to the back. The high gloss of the aluminum sheet complements the rich colors of any image to produce stunning results. Thanks Marg, GL & Carmen! Beth, great, swirling design. Actually I can see two crested birds facing each other. Macro photo taken of the underside of these textured swirl shaped leaves that someone said reminded them of fractals. Taken at the Franklin Park Conservatory in Columbus, Ohio.